Brazilian couple Luiz and Edna Toledo have a home made from rubbish, literally. Not content with building themselves a recycled mansion, the couple now plan to construct an entire community from waste. 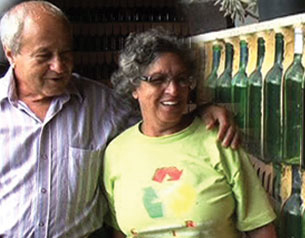 With walls made of bottles and a roof of bamboo, Luiz and Edna's house cost a fraction of a normal building. And now an ecologically sustainable village is on the drawing board. "It's definitely ecologically and economically sound, I think it's fantastic. This house is life", says local Government architect Laura. Could this be an alternative to Brazil's disease-ridden favelas?